My company just bought an ultimaker 3. I've had experience in the last 5 years with 4 or so other FDM machines from makerbot, lulzbot, and stratasys. I want to like the ultimaker. It's by far the quietest machine I've used, has a great form factor for the size, and is pretty. However I can't get it to print. The only successful print I have had is printing a test cube with 1mm (yes 1mm) layer height. Everything else fails part way into the print. The nozzle must jam, and the extruder wheel cuts a nice chunk out of the filament and it's done. Have to re load the material which usually takes it a couple of tries to get right. The last testcube I tried on "draft print" settings got about 20mm of the way up before it failed. Looked good right up until it didn't stopped. The Silver PLA that came with the machine. I should update my profile - I have been using the um3 for a month now. What layer height, speed and temperature are you printing at? When you have too much pressure in the head the force that the feeder exerts gets too high and it starts to grind at the feeder. The problem is possibly at the feeder but 95% chance the problem is at the head. If you print at 1mm layer height (yikes!) you need to keep the speed probably under about 8mm/sec with the .4mm nozzle. Or did you drill out the nozzle larger? Also check for filament tangles. I have more ideas but lets start with this. Lets keep that thought in mind, we all (want to) like Ultimaker! I think it is pretty unlikely that your nozzle jams, the print cores are very reliable. Can you upload some photo's from your feeder? What is the tension you have it set now? Do you have some photo's of your failed prints? - Why do you want to print at 1mm layer hight? At lower resolutions you can print faster and more reliable. With a 0.4mm nozzle, 1mm layer height is probably pushing the limits of what the nozzle can process. I would recommend to try another print, at something like 200 or 300 microns with the filament that came with the Ultimaker 3. Curious to hear how that goes! Haha, the 1mm layer height was purely to see if the jamming was occurring due to the nozzle being pushed into the material. Not desired other than just out of interest. So, I went back to the material that came with the printer, the mid range tension on the extruder, and re applied the default settings in cura. I was able to print a draft quality and normal quality testcube. Both turned out great. I was impressed with the "normal" quality. It's not a normal quality in my opinion at all. Compared to other prints, I'd call it superfine quality haha. I'm running a 6.5hr print right now, and about an hour in. Assuming it is done when I get back into work tomorrow I'll call this good. After failing a print again with the gold material, I pulled the filament back to swap back to the silver material, I noticed that right at the head there was one of those "chew" marks in it. Before I got my hands on the printer, someone else here was playing with it. I suspect what happened may have been that an initial jam was caused by something, possibly the Z height being a little off, possibly a tangled spool, who knows. 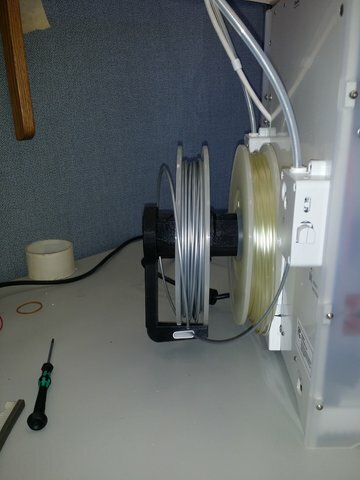 I did notice that the thin sample spool that came with the UM3 was thin enough to slide around on the holder and the filament could get off the side and tangle. After the initial jam, we might have pulled the filament out at the nozzle, trimmed up the end a little, then put it back in. Or perhaps failed attempts to correctly load fresh filament added a new chew point. Anyway, the chewed out section of filament was at this point somewhere between the extruder and the nozzle. Printer prints fine for a while. Then, once the chew section gets to the inlet to the heater cartridge, it jams up due to the weird shape. I guess I'll just have to be careful, and after a new filament load, inspect the filament as it travels through the bowden to ensure it looks free from marks. Anyhow, that's my figuring for now. Looks good anyway, still got to try PVA support and high quality. Thanks for suggestions. I'll keep you posted if I run into more problems! 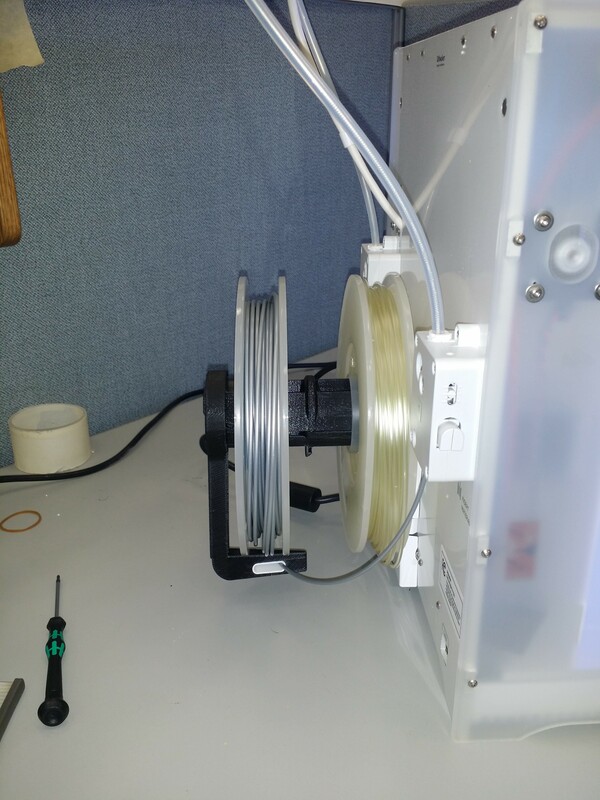 I did notice that the thin sample spool that came with the UM3 was thin enough to slide around on the holder and the filament could get off the side and tangle. Could you share a photo of what the back of your Ultimaker 3 looks like, especially having both reels of filament, and how they are mounted, on the photo? It could well have been because my co-worker's desk had a bunch of cables behind it also, so it could well have hit something to push it off centre. I haven't noticed this issue since it has been on my desk. I had similar issue trying out a 1.75mm filament, I was watching the filament very carefully as it was printing. 1/4 of the way through the print, it started to clog but just before that I noticed the filament had a couple of deep grind . I guess once those grinds go into the print core it just jams. My tension setting is right in the middle too. I will try again with some new UM3 filament coming soon. I've experience jam/under extrusion on the supplied UM3 filaments also. It's a tough nut to crack. Hi @AlexW, how is your Ultimaker 3 doing now? A grind probably also has some sharp edges and curling shreds of filament, and they can catch an edge somewhere in the printcore or on its way to it. I would not recommend to just insert 1.75mm filament, to do that reliably your printer would need more modifications.